When one considers public sector finances in Alberta over the last two decades the volatility is dizzying. This stems from the use of oil and gas revenues to fund public programs and services. Debate in Alberta has heated up recently after the Premier's Economic Council identified this as a problem and recommended that the government reduce its reliance on oil and gas revenues. The cuts to education have further raised the temperature on this debate by exposing how vulnerable it makes Albertans. This report contributes to that conversation by taking it the next step - how can we raise the revenues we need to cut our dependence on oil and gas? 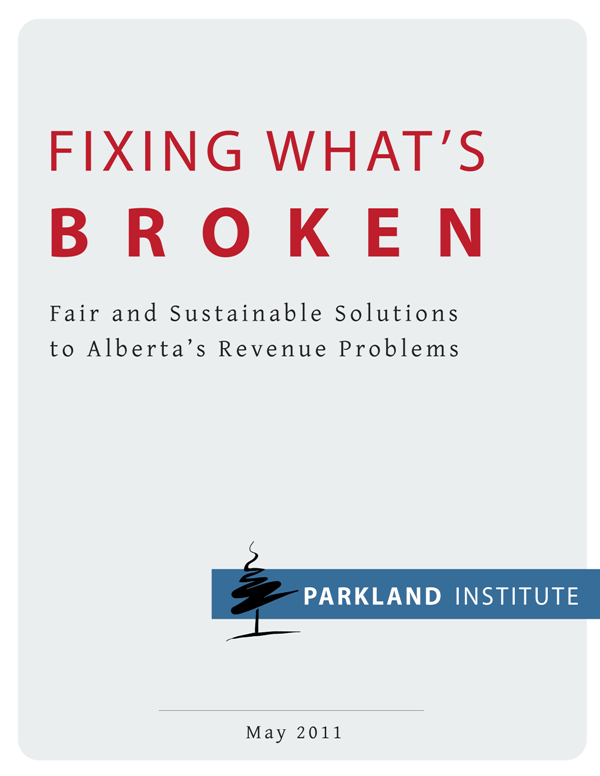 It explores what revenues Alberta currently brings in, how this revenue compares to other jurisdictions, what policy choices are possible and their effects on the budget. Alberta relies heavily on resource revenues to fund programs like health care and education. Resource revenues made up over 40% of the budget in the early 1990s, dropping to a low of approximately 19% in 2000/01, and rising again to approximately 35% in 2008/09. These revenues have been used to cut taxes and make Alberta by far the lowest tax jurisdiction in North America and one of the lowest of developed economies. Alberta’s reliance on tax revenue has been weak compared to other Canadian provinces. Alberta’s total taxes constitute just over 6% of provincial GDP, compared to a range of 8% to over 14% for other provinces. The Alberta government reports on its website that if Albertans and Alberta businesses were in any other province, they would pay between about $11 billion to almost $20 billion more in taxes. If Albertans decided to increase taxes there is considerable tax room to do so. Alberta is the only Canadian jurisdiction without a sales tax, and with the ‘flat tax’ and is relatively low on a number of other taxes. Alberta also has no revenue from mining and logging taxes levied on profits of natural resource-based industries. Because Alberta does not impose a provincial (general) sales tax (PST), its revenues from consumption taxes are the lowest in the country. Alberta brings in $1092 per person, approximately one-half the average (mean) of $2150. Alberta without a PST might be relatively lower in consumption taxes on the whole, but Alberta is significantly higher than the other provinces in the gaming revenue, at $462 per person—more than double the average of $199; and combined tobacco and liquor taxes are also higher, at $228 compared to $157. With gasoline and motive fuel taxes, though, Alberta is second-lowest, receiving only about 70% of the average, at $197 compared to $275. If gasoline and other motive fuels were increased to the average Alberta could obtain an additional $287 million. It is generally accepted that carbon dioxide emissions are a serious factor in global warming, as well as a local pollutant. A carbon tax is a general fee for carbon content of fuels like coal, oil, and gas to compensate for emissions produced from their use. The revenues could be put into programs to offset the financial impact for low income Albertans and to reduce costs for environmentally friendly activities such as transit, making it overall revenue neutral. Although the implementation of a carbon tax may not be a revenue generator, it should nonetheless be implemented in Alberta. In 2009 Alberta raised $12.44 billion in income tax revenue. This amounted to only 34% of own-source revenue and 31% to total revenue for the year. Personal income tax was $8.67 billion while corporate income tax revenue was $3.77 billion. In terms of gross provincial product (GDP) 2008 data, these tax revenues constitute a total of 4.47% of GDP; personal income tax was 2.86% of GDP; and corporate income tax was a mere 1.61% of GDP, this in a year with the highest income tax revenue ever achieved in the province. The combined federal/provincial corporate income tax rate currently at 28% has fallen from 33.62% in 2005 and is set to decline to 25% by 2012. Small business tax at 14% has also declined from tax rates in the 30% range. These corporate income tax reductions will give Canadian corporations the lowest tax rate on new business investment in the Group of Seven (G7) by 2011 and the lowest statutory tax rate in the G7 by 2012. Provinces are engaged in a race to the bottom, a race that no jurisdiction can win. There is no tax advantage for US companies as they pay the difference to the US Treasury. American corporations working in Canada will receive a tax credit for taxes paid (25%) in Canada but will pay rates of 35% at home. This constitutes a transfer of wealth from Canada to the US government of at least $1.1billion. Also, American firms also have higher health care costs. This is an extra cost to the firms above what Canadian firms have to contribute. Corporate taxes should be levied with this discrepancy in mind. It needs to be noted that the above tables showing tax rates show the statutory tax rates. Studies of effective tax rates show that what companies actually pay in tax is considerably lower. For example, a recent National Bureau of Economic Research paper finds Canada’s corporate tax rate to be 7% for domestic firms and 21% for multinational firms, when the statutory rate was about 36%. These loopholes and tax expenditures need to be closed. Alberta is the only jurisdiction with a single (flat) tax regime. Other provinces have from three to five tax brackets ranging from a low of 4% to a high of 17.5% (24% if we include Quebec). Alberta has by far the highest exempt income from personal income at $16,161. The tradition in the economics discipline extending at least as far back as Adam Smith’s Wealth of Nations (1776) has emphasized progressive taxation. Those with the greatest ability to pay—high-income earners—realize the largest benefits from the economic system, both economic and political. Therefore, it is expected that they would contribute to the public revenue needs more than proportionally to their income. The report proposes a simple and continuously progressive system. The taxes would proportionately transferred to higher incomes. Anyone earning less than $25,000 taxable income ($40,000 gross income) would have a reduced tax bill. 1. Public priorities should determine spending and tax levels - Albertans need to ascertain the appropriate level of public services to be provided by their government. This process obviously involves political ideologies and differing social norms mediated through the political process. It is quite amazing the degree of consensus that can be achieved through this process. For example, regardless of the quite vast ideological difference among citizens in Alberta there is almost complete agreement on the providing of healthcare through a public financed single-payer system. As well, education is quite universally seen as an investment in the future, and that it should largely be provided and funded through state mechanisms. Whatever the set of public services determined, the chosen set will imply a cost estimate, and therefore, the revenue the tax system needs to generate can be determined. Once the degree of tax revenues needed is established, the fairest tax structure can be determined to achieve this revenue target. 2. Increase resource rents and savings - It has been well documented that Alberta has been collecting far less resource rents than comparable jurisdictions with similar resources. Resource rents should be objectively determined by analysis. If we act to increase taxes and reduce reliance on resource revenues, we must have a commitment to save resource revenue in a permanent trust. For the purposes of current budget expenditures, only the annual income from the resource trust fund should be used. 3. Institute a simple and continuously progressive income tax system - It is of prime importance that Alberta implement a simple, fair, and progressive personal income tax regime to replace the current (2000) single tax rate system. As well as reinstating fairness to the tax system, a progressive tax system could bring in approximately an additional $1 billion in revenue while retaining the current (high) personal exemptions and reducing current taxes to lower income groups. Yet the rate increases for high income earners under such a regime would be reasonable. 4. Stop the downward spiral in corporate taxes - Corporate income taxes are on a downward death spiral as provincial (and national) jurisdictions compete for mobile investments. Firms are then paying less and less of the social costs of running a high functioning society. For Canada this leaves the healthcare and education systems particularly poorly funded at the same time that corporations increasingly require a healthy, well-educated workforce. We need to reassess the corporate income tax and cooperate or initiate national (and international) agreements to prevent beggar-your-neighbour corporate tax policies. 5. Raise Gasoline and fuel taxes - Gasoline and fuel taxes could be increased in Alberta without introducing any competitive disadvantage. This could bring in additional revenues in the hundreds of millions of dollars. 6. Alberta should introduce a carbon tax/levy - The British Columbia model could be considered. This levy would be used to correct the cost distortions caused by emitting carbon into the atmosphere without having to pay for it. The ‘tragedy of the commons’ in the form of global climate change and other environmental disruptions are the result of emissions being free. Carbon levies need to include charges in both production and consumption activities to address this. However, revenues should be returned to the payers for fairness, that their general standard of well-being is not changed, just their activities and mechanisms that produce carbon. Therefore, a carbon tax would generate no extra revenue for budget purposes. By introducing a provincial carbon tax Alberta may also scoop the federal government and prevent it from capturing that source of revenue. 7. Sales tax - It is well recognized that an income tax alone cannot capture tax fairly from all. For example, the wealthy can utilize the income tax act (and mechanisms) to reduce and avoid paying taxes. Though not ideal, in the absence of tax reform to close those loopholes, a sales tax is one more cut at collecting tax fairly and high income individuals do also spend more. A 5% general provincial sales tax should be introduced in Alberta. This would achieve approximately $5 billion in extra revenue. This sales tax should be ‘harmonized’ with the federal GST right from the start to eliminate any extra administration expenses. All revenue would go to public expenditures. At 5% a sales tax in Alberta would be minimally disruptive, would bring Alberta’s consumption taxes in line with the other provinces and therefore would have little or no impact on growth or competitive advantage of Alberta. This tax should come with a generous low-income rebate system.